Bill Matheson and Lou Lopez, teammates on the legendary (notorious? infamous?) 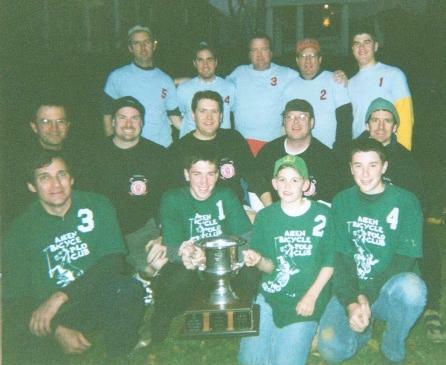 Boxwood team of the 1970's, teamed with Lopez's two sons and Charlottesville's Gaither Limehouse to win the 2002 Wendland Memorial, held in the historic Madison Bowl at the University of Virginia November 23. Lopez's elder son, LJ, is a second-year student at the University, and was instrumental in organizing the tournament. Three teams entered the event: Aiken, South Carolina; Boxwood; and Mt. Washington, based in Baltimore, MD. The Aiken squad boasted two members of the defending champion Aiken Prep team, Taylor Freeman and Seth Kopald, along with James Davisson and Eric Schmidt. The Mt. Washington entry was participating in their first BPAA event, and seemed mightily pleased with their silver medal finish. Both Boxwood and Mt. Washington added a player from Charlottesville, Gaither Limehouse and Greg Jackson, respectively, in order to give these local novices an opportunity to participate. 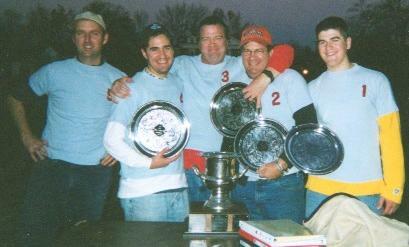 The event was held on a round-robin format, with each team playing two chukkers against each of the other two. In order to minimize the fatigue factor, only one chukker of each match was played before the third team came on the field to compete. Boxwood and Mt. Washington drew the first match, and their first chukker ended with Boxwood clinging to a 1-0 lead, the result of numerous wide shots by both teams. Aiken then took on Mt. Washington, and led 3-2 at the end of the period on goals by Freeman, Kopald, and Schmidt. Aaron Meisner and Doug McCoach scored for Mt. Washington. Boxwood then returned to action somewhat refreshed, and ran up a 6-0 lead on Aiken by the end of the chukker. In the second half of the Boxwood-Mt. Washington match, Boxwood managed to build a 4-0 lead before Mt. Washington scored with one second left. That goal must have given the Maryland squad a lift, because they scored three more against Aiken to win that game 5-3 and take second place. Boxwood scored three more on Aiken in the second half of their match, finishing ahead 9-0. Matheson led the way for Boxwood with four goals on the day, with Lou Lopez adding three, Matthew and LJ Lopez two apiece, and Limehouse one.